How Does Subscriptions Handle Staging Sites and Migrations? 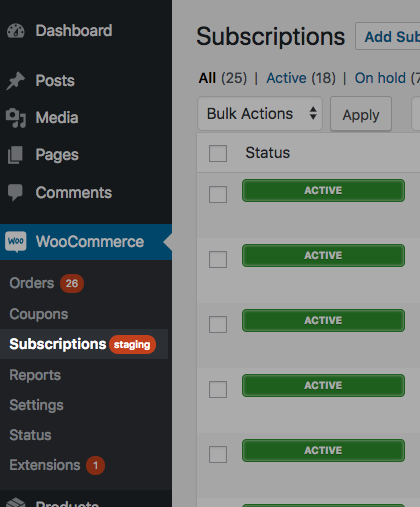 WooCommerce Subscriptions can handle staging sites and migrations. Some hosts, like SiteGround, provide an easy way to create a clone of your website for testing changes. This is called a staging site. To prevent duplicate payments from a clone of your site, Subscriptions will disable automatic payments and subscription-related emails whenever the current site’s URL differs to the URL of the site where Subscriptions was first activated. You will know when the site is in staging mode because Subscriptions will display a warning in the administration area of your site. This notice also shows which URL Subscriptions considers to be the live site. 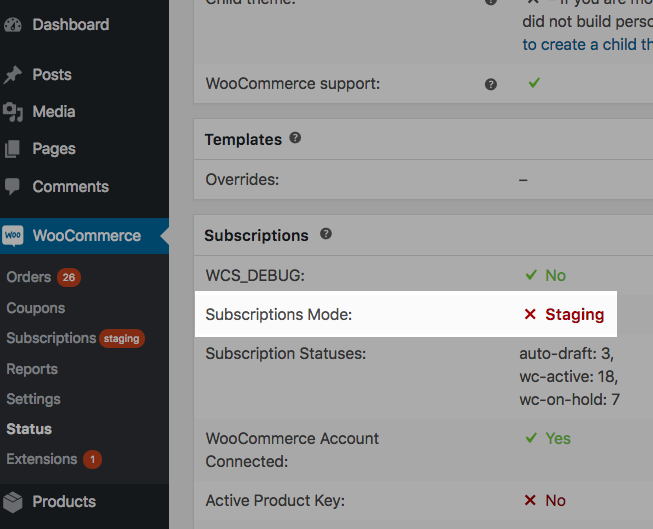 Subscriptions will also display a smaller warning next to the WooCommerce > Subscriptions menu item when a store is operating in Staging Mode. You can still test subscription renewals on a test site, but Subscriptions will use the manual renewal process and will not send any subscription-related emails. It is possible to enable automatic payments and to send subscription-relation emails on a staging site. Please note: it is only emails sent by Subscriptions that will be blocked by Subscriptions in staging mode, any emails sent or managed by WordPress, WooCommerce or another plugin may still be sent from your staging site. To block all emails from your site, install a plugin like Disable Emails. Subscriptions will keep a record of the URL of the site where it is first activated. It considers this to be the live site and will run in live mode. If the site’s URL then changes, it considers the new site to be a staging site and it will run in staging mode. This means if you first activate Subscriptions on a staging site, Subscriptions will run in live mode on the staging site because it considers this site to actually be your live site. Because of this, if you want to test Subscriptions on a staging site before running it on your life site, we recommend first activating it on the live site and then creating the staging site from that site’s database. Developer Note: Subscriptions stores a clone of WordPress’ siteurl value in an option with the name wc_subscriptions_siteurl. It compares this value with the siteurl value to see if it has changed. Check the Subscriptions menu item. If a red area is shown with the word Staging, the site is in Staging Mode. If nothing is displayed except “Subscriptions”, the site is in Live Mode. Check the value. If a red cross is shown with the word Staging, the site is in Staging Mode. If a tick mark is shown with the word Live, the site is in Live Mode. Below this section will be a row labeled Subscriptions Live URL. This shows the URL that Subscriptions considers to be the live site. Click the Enable Automatic Payments button displayed in the staging site notice. Change the option value of the 'wcs_ignore_duplicate_siteurl_notice' option to anything other than its current value, “false” would be a good choice. The staging site notice should reappear and you can choose to Enable automatic payments. When migrating your site’s database from one server to another server, there are additional considerations. Disable WP-Cron (or any other cron system you have manually setup) to ensure Subscriptions doesn’t trigger renewal events. To avoid any issues with duplicate payments or emails, you should decommission the old site as soon as possible. Without completing one of these steps, your old site will continue to process real recurring payments. We also suggest you block all emails from your duplicate site to prevent customers receiving any emails from this old site. To do this, you can use a plugin like Disable Emails (this plugin is not officially endorsed by WooCommerce.com). By default, scheduled renewals and other scheduled events, like expiration, will still be triggered when Subscriptions is in staging mode. No payments will be attempted, or emails sent, for these events, but the event will still be initiated as it would be on the live site. If you wish to stop these events being triggered, install and activate the free Action Scheduler – Disable Default Runner plugin. This plugin disables all events in the scheduling library WooCommerce Subscriptions uses. This library is also used by other extensions, like WooCommerce Memberships, so will also disable any scheduled events for those plugins. The Action Scheduler – Disable Default Runner plugin does not rely on the site URL check. Once active, it will block scheduled events. As a result, it can also be used on a live site to temporarily disable renewals payments and other scheduled events. If you would like to enable subscription-related emails on a staging site, you can define the WCS_FORCE_EMAIL constant. To process renewals correctly, Subscriptions requires your WordPress site to be accessible via only one URL. You should also make sure your web server software, like Apache, is configured to redirect any requests to other URLs to the canonical URL. WordPress has a guide on setting up .htaccess file correctly. If you need additional help, please contact your web host. While not technically a penalty, duplicate content can still sometimes impact search engine rankings. When there are multiple pieces of, as Google calls it, “appreciably similar” content in more than one location on the Internet, it can be difficult for search engines to decide which version is more relevant to a given search query. What does Subscriptions consider a Staging Site? Why are renewal payments not processing on the live site?